Manaslu Trekking is one of the most spectacular trekking in the Himalaya; reward the adventurous with an unparalleled alpine experience in a comparable to the other parts trekking of Nepal. Mt. Manaslu, the 8th highest peak on the planet, locally known as the 'mountain of the spirit', is one of the most spectacular snow-peaks in Nepal. Manaslu circuit Trek touches unspoilt regions since it was off limits until recently. Now open to organized trekking parties only, the area offers a good mix of cultural diversity and fantastic mountain scenery. 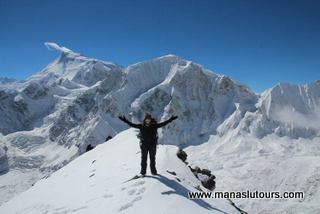 Manaslu Trek is extended and strenuous trek, circling the Manaslu range which was opened for trekkers in 1992. Manaslu circuit Trek is to the north the river valley of the Budhi Gandaki River and then behind Mt. Himalchuli (7,893m), Peak 29 (7,839 m.) and Mt. Manaslu (8,163m) to cross the Larkya La Pass at 5,213m, this fascinating trek explores areas and the way of life unchanged for decades and maybe, even centuries. Manaslu circuit Trek is strenuous trekking inconstantly rewarded with brilliant mountain vistas of the Ganesh and Manaslu Himal ranges and insights into the cultures of a cross-section of ethnic Nepalese tribes and peoples of Gurung, Magar, Tamang and Bhotias (Tibetan) are higly inhibited in this region. Around Manaslu circuit Trek start from Budhi Gandaki, the trek goes through the narrow gorge between the Manaslu and Ganesh Himal ranges, with steep, almost perpendicular sides passing through the Nupri valley, where the inhabitants appear Tibetan in look, speech and customs, the trail continues parallel to the Tibetan border, with sensational views of Manaslu North, Ngadi and Himalchuli peaks. Crossing the 16,000ft (5,213m) Larkye La pass, the trek descends to the Marsyangdi valley, with fantastic views of Himlung Himal, Annapurna range and other peaks.